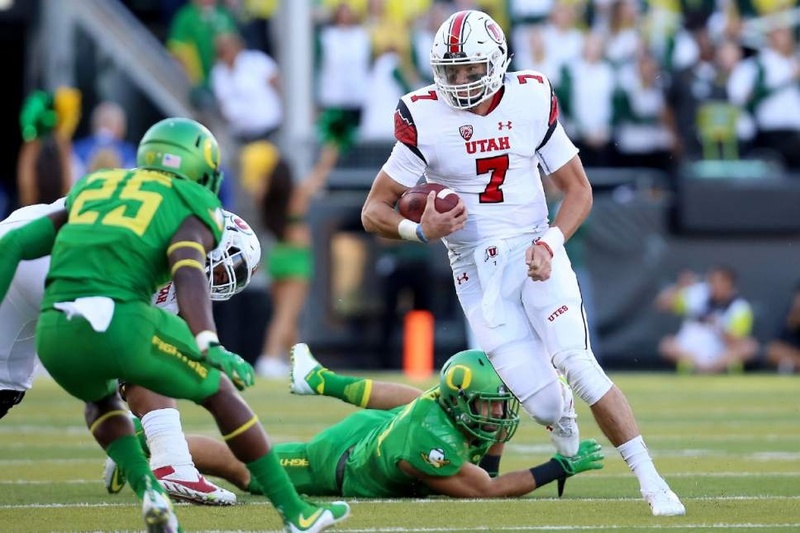 America was re-introduced to Utah Football and Coach Kyle Whittingham in a big way last night. The Utes absolutely destroyed Oregon 62-20 in Eugene on FOX. There were so many positives for Utah and the win was monumental for the program. Probably the most notable take-away is that the contest started at 5:30 Pacific, which of course meant 8:30 Eastern. Rather than the typical Pac-12 7:00 Pacific kick-off (10:00 eastern) that none of the SEC honks watch or the all-important sports writers in the Northeast wouldn’t watch, this was Fox’s prime time game for all the country to see. And a changing of the guard in the Pac-12 is what they were treated to. I don’t know how else to say it other than this game was program defining for both schools. Oregon played in the national championship just 4 games ago. Sure, Michigan State got them last week, but Michigan State may be the best team in the country. However, Utah blew in to town and put the country on notice that Oregon’s fun n gun offense is no longer the gold standard in the Pac-12. Utah showed their team is far better than Oregon and that the Utes’ defense can handle just about anyone. So how did it happen? Utah played incredible defense like they always do. They bottled up whichever of the 3 quarterbacks Oregon threw at them. Utah’s offense finally woke up! Travis Wilson played a fantastic game. He was 18-30 for 267 yards and 4 TD’s. Wilson also had 100 yards rushing and scored a touchdown on the ground. This was the offense Utah has been in desperate need of. If they can continue to get quarterback play like that, like I’ve said in others posts – look out because Utah can be scary good. Utah should really jump up to #10 or 11 in the polls. Their Aussie “rugby style” punter Tom Hackett actually hit the overhead camera wire with his punt. The officials decided to re-play the down. Rather than just re-kick, Whittingham decided to stick it to Oregon and dialed up a fake punt. Hackett grabbed a high snap and ran for the first down. Based on outcome of this game last night, you have got to figure Utah is one of the favorites to win the Pac-12 South. USC is not invincible, Arizona State is not the monster we thought they were gonna be. UCLA is really the other front-runner in the south division. It’s gonna be a great race.